Have you taken any pretty EVE pictures recently? I haven’t, but then I have been busy taking pictures of other games as part of my other duties. Here’s one I took the other day; from a game released way back in 1988. Can you guess what game it’s from? Go on, look a little harder. Maybe it will help if I remind you that 1988 was an era when game names were often engraved into the UI as a way to fill space, since there were very few games that could fill the screen otherwise. What we’re after is much the same as what always ask for; beautiful in-game EVE images at a high-ish resolution and the UI turned off, along with a few lines about what is going on and where (where is especially important). Don’t forget to include your character name in your email either. Those that have their images published will earn themselves 100m ISK. Just send your pics and text to postcards@mmmpublishing.com by downtime on Friday. The only name I see is Pong, but I know that’s not the name of this game. It’s obscured by the thought bubble. 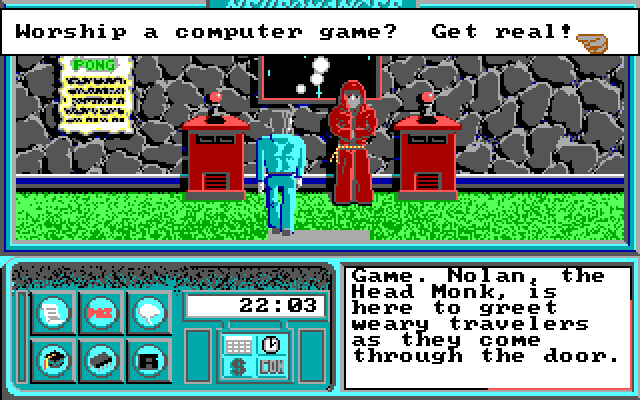 It’s “Neuromancer”, which was very loosely based on the book, and was fairly good for its time.